Happy New Year, South Carolina! As the sun sets on 2012, we hope this beautiful sunrise beaming across the Coosawhatchie River will fill you with optimism and hope for the upcoming new year. Named for the Coosa Indians who once inhabited its banks, the Coosawhatchie River (pronounced KOO-suh-HATCH-ee) is a tidal river which originates near the towns of Allendale and Fairfax. It flows southeast until it joins the Broad River and eventually empties into the Atlantic Ocean. The Coosa tribe was a subtribe of the Cusabo, which loosely translates as Coosawatchie River people. Unfortunately, the Cusabo and its subtribes are now extinct. During the late 1600s and early 1700s, they suffered attacks by both colonists and the fierce Yuchi tribe. The enslavement of Indians was also officially sanctioned during this time, and many Cusabo were sold to plantations in the West Indies. By 1750 the Cusabo no longer existed as a distinct tribe, and it is commonly believed that its members merged with the Catawbas or the Creek of Georgia. Altogether, the Coosawhatchie River flows through four South Carolina counties: Allendale, Hampton, Jasper, and Beaufort. The areas surrounding the river were home to several Civil War and American Revolution battles, including the Battle of Coosawhatchie in 1779. Many thanks to Lamar Nix for sharing this photo he took during a low tide sunrise in 2010. Do you have information about the Coosawhatchie River you'd like to share with our state? Send it here. 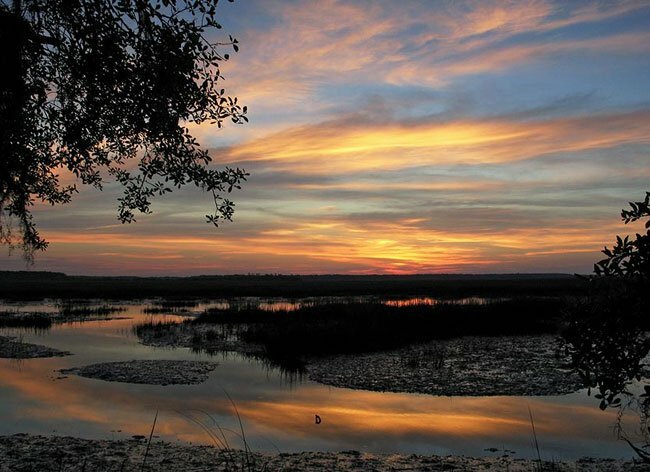 Also, take some time to add your pictures to SCIWAY's South Carolina Picture Project. The next "SC Photo of the Month" could be yours! Inspired by PBS's "Antiques Roadshow," the South Carolina State Museum will offer informal appraisals of a variety of objects. Museum curators and local experts will be on hand not only to discuss items, but also to provide tips on caring for them. Come join us to race through the scenic Lowcountry and raise funds to support fine arts programs in our community schools! All proceeds benefit the Youth Endowment for the Arts! Want to see the full calendar? Click here to check out SCIWAY's complete calendar of January SC events! Also, remember that all of our event calendars, for every month of the year, are always available on SCIWAY's website – just go to https://www.sciway.net/calendar.html. © 2013 SCIWAY.net, LLC. SCIWAY News is written by SCIWAY – with a lot of help from people throughout South Carolina. ISSN: 1537-3903.